Gareth Bale’s new six-year Real Madrid contract will see the Welshman reportedly rake in well in excess of 115 million euros ($126 million) as the Spanish giants bet on Bale to lead another glorious era at the Santiago Bernabeu. Bale, who has won two Champions League titles in three years in Spain, solidifies his position as one of the highest earners in football along with the likes of Real team-mate Cristiano Ronaldo and Barcelona duo Lionel Messi and Neymar. 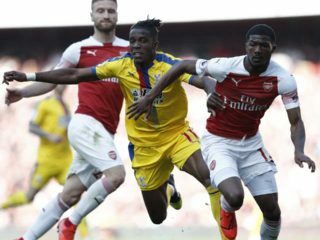 The flying winger, 27, is set to take home as much as £350,000 a week after tax, according to British media, though figures vary wildly. However, Ronaldo looks set to retain his status as top dog of the pay packet at the Bernabeu with the Portuguese expected to become the latest Madrid star to extend his deal in the coming weeks. Real have already handed lucrative renewals to Luka Modric, Toni Kroos and Lucas Vazquez to hold onto their key men with a one-year transfer ban imposed by FIFA to come over the next two transfer windows. Madrid arch rivals Barcelona have embarked on a fleet of renewals to ward off interest from the cash-rich Premier League, backed by a £5 billion ($6 billion) domestic TV deal. Neymar reportedly rejected an astronomical offer from Paris Saint-Germain and extended his Barca deal to 2021. Barca president Josep Maria Bartomeu confirmed at the club’s annual general meeting on Saturday that contract negotiations with Luis Suarez and Messi are also under way. Madrid have topped the Deloitte Football Money League for the past 11 years as the highest earning club, but were overtaken last season by Barca. Bale joined Real for a then-world record fee of just over 100 million euros from Tottenham Hotspur in 2013. That figure has since been eclipsed by Paul Pogba’s 105-million-euro move to Manchester United in August. Despite the desire to keep 31-year-old Ronaldo at the Bernabeu for the rest of his career, Real president Florentino Perez has long believed Bale is the man to succeed Ronaldo as Real’s best and most marketable player. Bale has enjoyed and endured plenty of ups and downs in his three seasons in the Spanish capital. Goals to win the 2014 Champions League and Copa del Rey finals made him an instant hit. However, he suffered from stinging criticism and was jeered by the Real fans towards the end of his second season as Madrid ended the campaign trophyless under Carlo Ancelotti. Yet Perez’s faith and belief for the future was only emboldened by Bale’s sensational form towards the end of last season with Ronaldo a more peripheral figure due to a recurring knee injury. Bale led Madrid on a 12-game winning run to end the La Liga season to miss out on the title by just a point and to an 11th European Cup with a penalty shootout win over city rivals Atletico Madrid. His performances in inspiring Wales to the Euro 2016 semi-finals — their best run in a major finals — confirmed his status as one of the world’s best. And a first ever place on the podium for the Ballon d’Or could follow after Bale was named among the 30 nominees for the prize last week.